On the morning of 6th October 1976, nationalist vigilantes and soldiers launched an armed attack on Thammasat University in Bangkok. 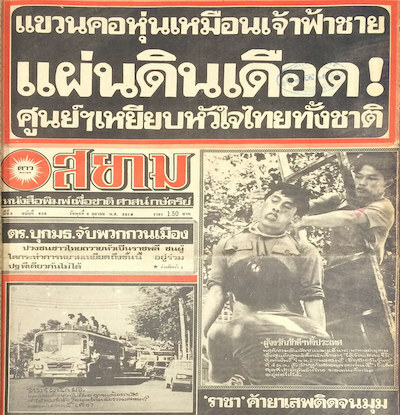 The massacre, prompted by a Dao Siam (ดาวสยาม) headline demonising Thammasat students, remains one of the most violent episodes in Thailand's modern history. Its depiction in films and art has caused controversy and led to censorship, in an ongoing effort to whitewash the event. I've written a survey of the representation of the massacre in Thai cinema, covering documentaries, short films, and feature films.